Carrying out maintenance on slot cars is easy. There is not much that can go wrong with the model and all the parts are easily accessible. If for any reason you do not wish to open up your model there are plenty of model shops that can service your model for you. To service your model the first thing you are going to have to do is open up your model. You can do this usually by removing a few screws located under the vehicle with a small screw driver. I would recommend you first remove the blade unit as their is usually a screw located behind it. 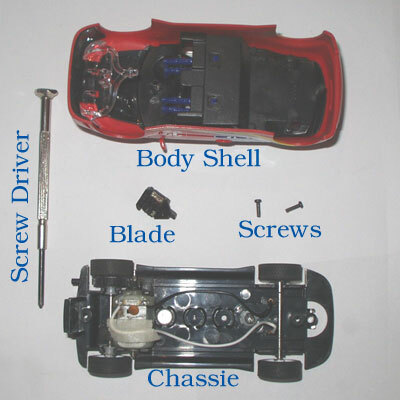 Below is a picture of a Scalextric ford focus and the basic layout of its components. 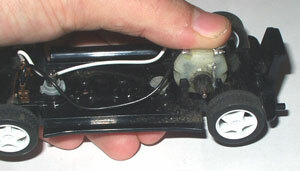 Braids or brushes, are the two wire mesh tabs that connect with the powered track, to give power to the car. 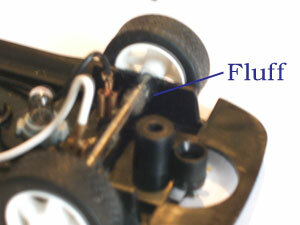 They are fitted to the blade assembly which guides the slot car around the track. Worn braids increase the likely hood of the car losing power. 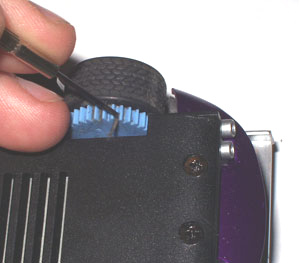 When your braids are worn it is a simple matter of removing the old blade unit and replacing it with a new one. This is easy as they simply pull off with very little difficulty. New blades come with every new model and are also available in packs of 4. If the blades are simply frayed you can neaten them up with wire cutters or an old pair of scissors (they will blunt scissors). 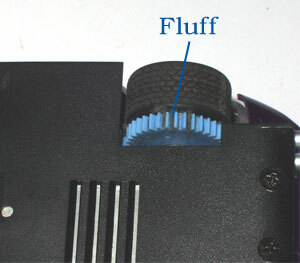 You have probably noticed that the large gear visible under the car is covered in fluff. This is inevitable especially if like me you put your layout on the carpet. the easiest method to remove this dirt and improve performance is to get a small screw driver and scrape of the dirt from the large gear. There will be more dirt inside that will affect performance, but you will have to open the car up to get at it and as it will fill back up almost immediately you might as well leave it unless you are competing. If you wish to clean inside then you need to unscrew the screws underneath the car. this should separate the body work and the chassis. then with tweezers or a small screwdriver, remove the dirt that has collected. 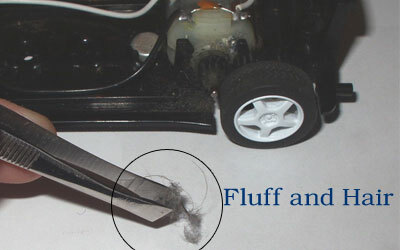 The worst dirt to remove is usually the hairs and fibres that have become entangled around the wheels. In the most extreme circumstances it may be quicker to remove the wheels. Gears will wear over time especially if the model racks up lots of hours around your track. If they look worn or you are experiencing loss of power or strange noises then the gear is probably slipping. You also may on rare occasion brake one of the gears teeth usually from the result of a high speed crash or the gears seizing for some reason.. If this happens you will probably hear a lot of horrible noise from you model and will have to replace the gear. Like all the other moving parts, motors do not last for ever. Signs of a bad motor are slower running, running very hot, or not running at all. If you model starts off running well but then gets slower and slower then you probably got a bad motor and should replace it. The same goes if you smell burning (unless not run for a while), see smoke, or the light on you power supply dims when you run the model (the dim is the result of resistance from the motor). 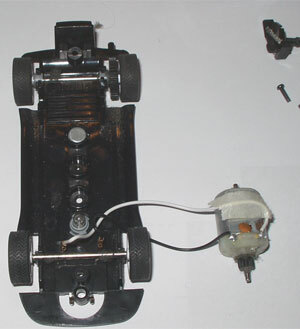 To replace the motor simply open up the model (first taking out the blade unit), removing the screws underneath (note that one is often hidden under the blade unit). Disconnect the wires that connect the motor to the braids and the blade unit and then with a screwdriver (to aid leverage) pop the old motor out. then its just a matter of pushing the new motor in place and your done. If the new motor does not have a gear on it simply use the old one which should slide off. Worn tyres will reduce your cars performance especially in the two most critical areas, around bends and when trying to slow down. Please remember manufactures do produce replacement tyres, but you need to find the ones that will fit on your model. consult the service sheet for your model. Slick tyres are also not the best for grip but they may be appropriate for the driving characteristics of that car. For example a F1 or TVR are very powerful cars. If you floored them out of a corner then you would spin. By reducing there grip it makes them more realistic to drive and more fun in my opinion. A for wheel drive super car like the MG Lola should have more grip like it has in real life. In the end the performance is up to you. You can go for the fastest gripiest car or the most realistic driving characteristics. 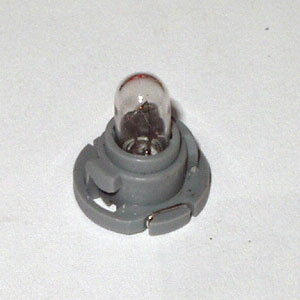 Scalextric have a simple lighting system in most of their cars which consists of a single screw in bulb illustrated below. To fit a new bulb you first have to remove the old one with a flat headed screwdriver turning the bulb anti-clockwise and then pulling it out. You then pop in the new bulb and screw it in clockwise until it stops. If your car does not come with lights but it has the hole for it (usually filled with a rubber bung) there is no reason why you cant ad one. I added lights to this focus which came without them as it was part of a set. the whole car glows a bit because the car does not have the light focusing system but it still looks good. Not all models are this simple, some models have a different set up and may require a soldering iron. Scalextric Service Sheets give you the information required to maintain your models and the part codes required to buy replacement parts. Download Service Sheets from www.scalextric.co.uk or click on the links below to be redirected. In my experience the track needs very little maintenance if treated well. If you run your layout in a moist environment like an unconverted loft, shed of garage, then expect rust and dust to become a problem. Unconverted lofts, sheds and garages are not the ideal place for a layout, but they are often the only option. To reduce the likely hood of dust and rust, cover you layout over with a sheet after use. This should stop the dust settling on it and absorb some of the moisture in the air. The most common way of cleaning your track is with a damp lint free cloth. Remember to turn the power off when cleaning. simply wipe both the plastic track and the metal rails. its important not to leave any moisture on the rails to reduce the possibility of them rusting. 1. Clean it - use a wire brush to take off the worse of the rust and then polish it with a railway track rubber. I use the PECO rubber as the Hornby model is not abrasive enough. Please remember that the track will be pitted due to the rust. It will also be more susceptible to getting rust again as it would have lost its protective coating. It might be best to either bin the section or cut the rusted bit off to make a custom piece of track. I would bin it. Always store rusted track in a separate place to you good track as the rust could stain you better pieces. 2. to stop the rust coming back u need to apply a small amount of either oil or WD40 with a rag. make sure you get to all of the areas that had rust on them. Don't apply too much or you are going to gunge up your braids, blade unit, tyres etc. That's why I would recommend binning it.